If you don't have convenient tree branches to use when hanging our bird feeders, try this Heavy Duty Pole. It allows you to mount your wooden bird feeder anywhere in your yard or garden. 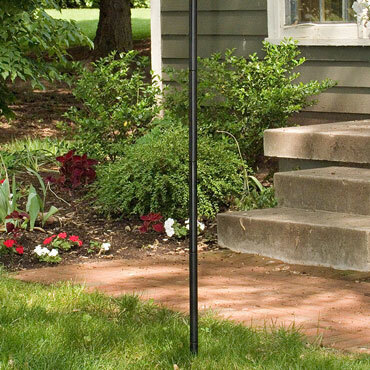 This sturdy metal pole is finished with a long-lasting, rust-resistant black powder coat that keeps it looking good for years. It's easy to assemble since it has one straight pole section for insertion in the ground, and just 5 additional sections that fit together to create a remarkably strong, 6-foot pole. The set also includes 4 wood screws and a flange to attach to the feeder and fit over the pole. All that's left to find is the feeder and bird seed!